The σ-ε curve for a material (say mild steel) is shown in the Fig. 1.1. Up to the proportionality point A, the stress-strain variation is linear. Up to this point Hooke's law holds good. Beyond point A and up to point B, material remains elastic i.e., the material remains to its original condition of the force acting on it is removed. If the specimen is stressed beyond point B, permanent set takes place and we enter plastic deformation region. In the plastic deformation region, the strain does not get fully removed even with the removal of the force causing it. If the force is increased further, point 'C' is reached, where the test specimen streches even when the stress is not increased. This point is called Yield point. In fact, there are two Yield points C and D which are called upper and lower yield points respectively. With further straining, the effect of this phenomenon called strain hardening or work hardening takes place. The material becomes stronger and harder and its load bearing capacity increases. The test specimen is therefore able to bear more stress. On progressively increasing the force acting on the specimen, point E is reached. 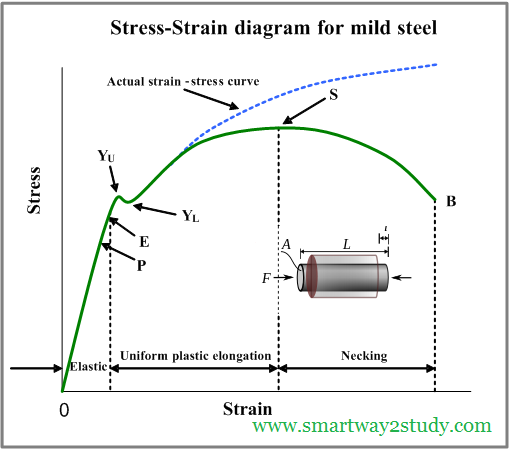 This point is the highest point in the stress-strain curve and represents the point of maximum stress. It is, therefore, called Ultimate Tensile Strength (UTS) of the material. It is equal to the maximum load applied divided by the original cross-sectional area (A0) of the test specimen. Here, we must consider the effect of increasing load on the cross-sectional area of the test specimen. As plastic deformation increases, the cross-sectional area of the specimen decreases. However for calculation of the stress in the stress-strain graph, the original cross-sectional area is considered. It is for this reason, that the point of breakage F seems to occur at a lower stress level than the UTS point E. After UTS point E, a sharp reduction in cross-sectional area of the test specimen takes place and a "neck" is formed in the centre of the specimen. Ultimately the test specimen breaks in two pieces as the neck becomes thinner and thinner. The actual breaking stress is much higher than the UTS, if the reduced cross-sectional area of the test specimen is taken into account. The measure of the strength of a material is the ultimate tensile strength (σ at point E). However, from the point of view of a design engineer, the yield point is more important as the structure designed by him should withstand forces without yielding. 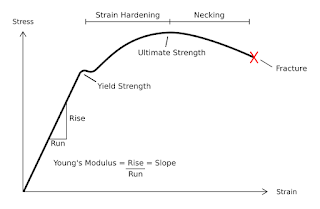 Usually yield stress (σ at point D) is two-thirds of the UTS and this is referred to as yield-strength of the material. In actual practice, to determine UTS, a tensile test is carried out on a tensile testing or a universal testing machine. 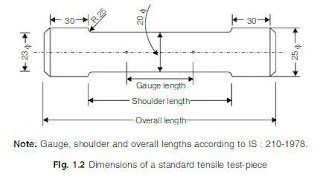 In order that tests conducted in different laboratories on the same material may give identical test results, the test piece used for the tensile test has been standardized. A standard test piece is shown in Fig. 1.2. 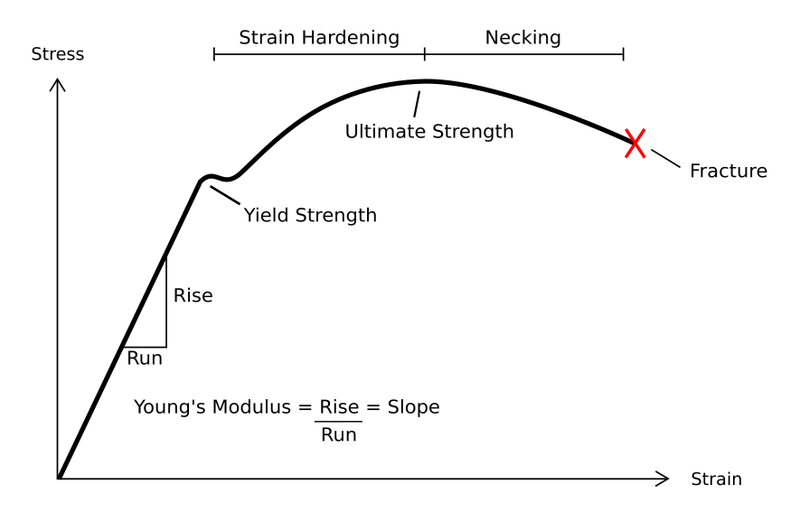 A stress-strain curve for brittle material is obtained by subjecting a test bar of such material in a tensile testing machine. 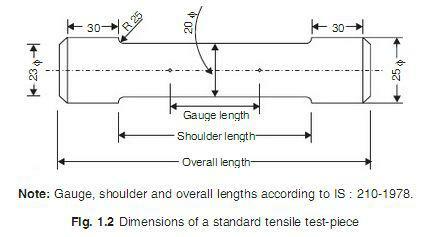 The tensile load is gradually increased and the extension of the test piece is recorded. 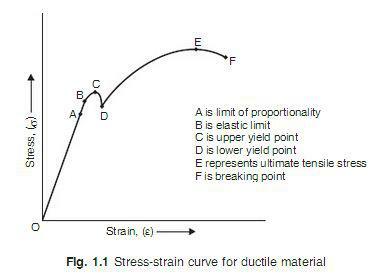 The stress-strain curve for a brittle material shows some marked differences as compared to the curve obtained for a ductile material. 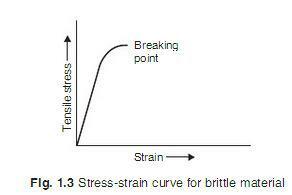 A typical stress-strain curve for a brittle material is shown in Fig.1.3. This curve displays no yield point, and the test specimen breaks suddenly without any appreciable necking or extension. In the absence of a yield point, concept of "proof-stress" has been evolved for measuring yield strength of a brittle material. For example, 0.2% proof-stress indicates the stress at which the test specimen 'suffers' a permanent elongation equal to 0.2% of initial gauge length and is denoted by σ 0.2. The tensile test and the stress-strain curve has been described above in some detail, because a lot of useful information with regard to other properties of material can be cleaned from it. It may be noted that most tensile testing machines are provided with equipment to carry out a compressive strength test as well.